Disclaimer: I'm not coming out of retirement.. but I thought this was interesting, and couldn't find an English source to show people. The story started when a teacher was accused of sexually abusing kindergarten kids in the Antwerp school De Blokkendoos, this past June. For days parents protested outside the school, and finally the school was forced to close a week ahead of the summer vacation. The teacher and administration of the school also received death threats and had to go into hiding. The case has not been officially closed, but the Mayor of Antwerp Bart De Wever recently announced that the teacher had been wrongly accused. It turns out that the mother who first complained is Najat Mejdoubi, who said the teacher had raped and abused her 4-year old son. 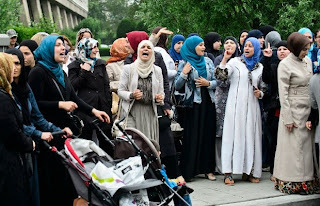 Majdoubi is a member of Sharia Sisters, a sister organization of Sharia4Belgium. Dozens of parents joined in the accusations, three turned to the police. It's not clear whether the hysteria that followed was orchestrated by any organization, but according to a court source, the case fits well with the Sharia4Belgium strategy. "We saw the same phenomenon with the niqab incident in Molenbeek last year. A number of extremists tried to use the De Blokkendoos story to incite the community against everything non-Muslim." The source continued, that though there were protests at the school, the inciters hadn't managed to inflame the rest of the Muslim community, which is to the merit of the Muslim community itself. The Federal prosecution is investigating whether Sharia Sisters was involved in the death threats. The Antwerp prosecution is still investigating complaints of abuse, though they say that no evidence has been found of it. They refused to comment on the possible involvement of Sharia Sisters and Sharia4Belgium. Three of the parents intend to file a civil case against the teacher. The 23-year old teacher will not be returning to the school. According to the school administration, it won't be good for the parents, for the other teachers and especially for her. They've found a different school for her, where she'll be teaching next September. They've also given the other teachers the option to change school. Mayor De Wever advised all victims of the false accusation to file charges against the inciters of the mass hysteria. "In my opinion, those responsible cannot be punished severely enough." Islamists and Muslims have controversy amongst as much as Islamists Muslims and Musalmans who united to oust Mr Bhutto the leader of Islamic Organization of Countries ,blankly failed to pray behind one imam at the meeting at National Assembly Hostel. What “truth” are you talking about?